As highlighted in this press release, Intel has been creating agreements with display manufacturers in order to promote touch-enabled Ultrabooks. This confirms earlier reports which claimed Intel had begun encouraging OEMs to include touch-sensitive displays on their Ultrabook products. 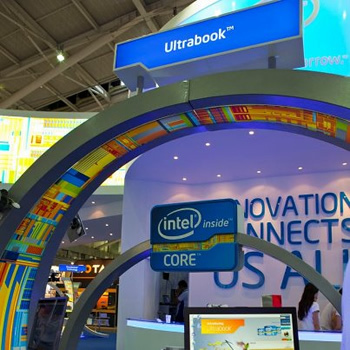 Intel has been an active evangelist of Ultrabooks, a term which Intel itself coined. Ultrabooks are laptops which are exceptionally thin and light but aim to offer higher performance and a bigger screen than netbooks. Requirements to qualify as an Ultrabook have fluctuated in recent history, but third-generation Ultrabooks must exhibit a thickness no greater than 18mm (for screens less than 14 inches) or 21mm (for screens larger than 14 inches), at least 5 hours of battery life, USB 3.0 or Thunderbolt and the inclusion of various Intel technologies. Intel senior VP Tom Kilroy also told Engadget that the chip maker is investing in manufacturers who specifically produce touch displays that are 13 inches and greater. This suggests that Intel may be trying to nudge the industry into producing Ultrabooks with larger average screen sizes as well. Kilroy also revealed that he expects the "majority" of Ultrabooks to have touchscreen capability before the end of next year. However, he admitted there will likely always be a market for not-so-touchable Ultrabooks. It is clear that Intel intends Ultrabooks to be a commercial success. The company continues to invest resources into promoting and improving the ultra-slim laptops. Just yesterday, Intel announced a new design for plastic chassis which it claims will rival the quality of die-case and machine aluminum, but at a fraction of the cost.